Words have powerful meanings behind them and they should not be underestimated. This is why people carefully choose what they say. However, that’s not at all why chose Jell-o as my favorite word. I chose it simply because I like saying it. The English language has always had a poorly fixed system of rules that seem to have more exceptions than most math equations. Jello is a great example about how we pronounce some things so differently than others. Jello’s emphasis on the letter o always sounded strange to me. And I mean strange in a good way. The company Jell-O clearly had a couple of creative founders. In addition to being my favorite word, this fruity dessert is also one of my favorite desserts. There are some things in it I don’t enjoy thinking about such as animal bones and some other nasty things, but I do my best to forget. It also brings a strange nostalgic effect to me because I alway mixed up words and jello was probably the best example for this. In Sri Lanka, jello and jelly were basically synonyms. This led to quite a few confusing arguments over what we should eat. 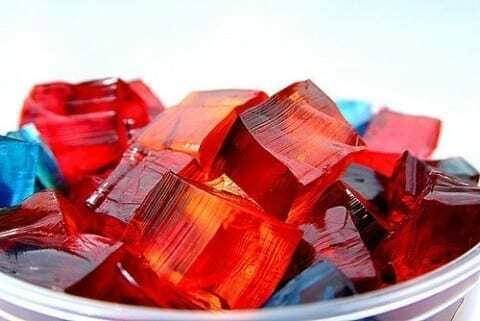 Jello may be the official name, but people use jello and Jell-O interchangeably. They sounds the same, but I like how one looks a lot more Jello’s look deserves a mediocre score at best, while Jell-O deserves a perfect score plus a hundred for its looks. The random hyphen and Capitalization just add on to its uniqueness. This word has style and a fun pronunciation, that’s why it reigns above the rest. Jell-O by Nishan is licensed under a Creative Commons Attribution-ShareAlike 4.0 International License. I’m a little late to the party, but I like the word Jell-O too (love the emphasis on the O)! I absolutely love your intro as well. Americans do come up with a unique meaning for a product. Sometimes, I forget that jell-O is animal bones, etc. and not just a fruity flavor! Overall great arguments especially when you linked Sri Lanka in there. I agree with the fact you stated. Words do have powerful meanings that they stand for. Though Jello might be disregarded as a simple, nonsense word, a meaning could be interpreted from it, sort of like what you did here. I am interested in your post because we can feel your passion and excitement for jello. Although you do need to fix a few errors throughout your post. There are errors in the way you are spelling certain words. One thing you said that stands out to me is “The English language has always had a poorly fixed system of rules that seem to have more exceptions than most math equations.” I agree with that because it is true, speaking English seems to be harder than math sometimes! Cool story, you should try using the word Jello with a personal connection to help better your story. It will help the story come together more. The use of words is not just to take up space, some of these words really do have deeper meanings. Great story , you should try connecting the Jello back to a personal connection to help pursue your story. It will help the story flow together more. This using of words is not just to take up space, some of these words really do have deeper meanings. Try improving your grammar to be able to sound more sophisticated. I agree with words have a powerful meaning and people should not just say things without knowing what they mean.One reason I say this is because words can really get to someone,sometimes something that you say to someone can stick in their minds for a long time either positive or negative. I do agree with you that words have powerful meanings behind them and they should not be underestimated. One reason I say this is because, words aren’t just letters put together in a sentence, they are more then that, and I think words do have deeper meanings.